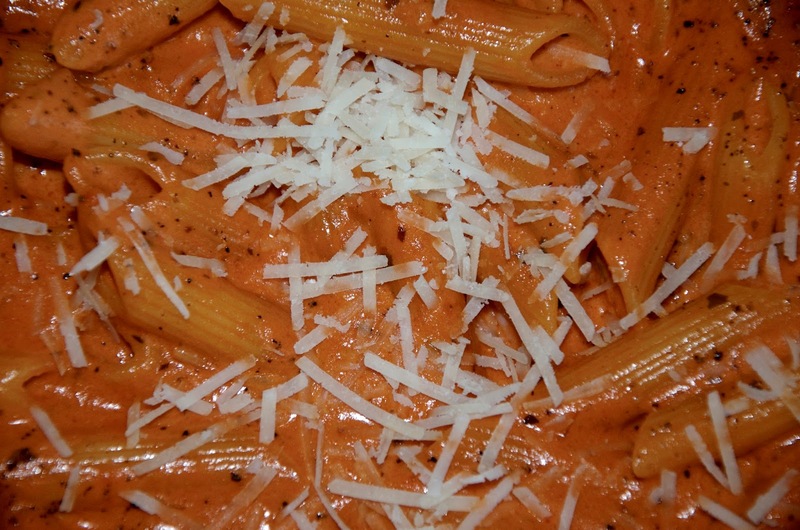 This is one of my all time favorite pasta dishes. I remember the first time I had it when I was at University of Miami and I went out with some friends for dinner. Someone ordered it and I thought it sounded so odd, but then when I had a taste I was instantly hooked and went back to the same restaurant the following week to have it myself. In all fairness, I don't think the version I had then was the best, but I remember how it tasted so new and different to me. 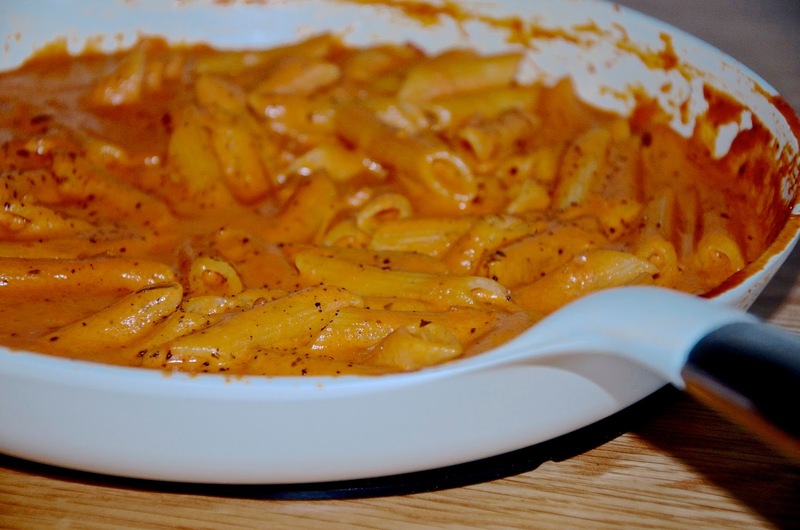 I also remember that it was really pink and since I've started making various incarnations of this dish, I've never once had it turn out pink, but always a rich sort of orangey red color. I've made version after version of this pasta, but I've finally nailed down all the components for my favorite rendition of this Italian classic. What's better is that it's so easy to make, doesn't take very long and can be whipped up with ingredients you may very well already have in your kitchen or can at least get quite easily. Some versions use onions, but I find that shallots are really the way to go. The taste isn't all that different, but they cook faster and to me, there's no better smell than shallots cooking in butter! Also, while some would insist on using prosciutto which is totally delicious as well, I find that it's more convenient to use regular ham and in fact, I typically use a pack of not-too-thickly sliced, but sturdy honey ham that I would normally use for sandwiches as I find the texture is a nice contrast to the pasta and the creamy sauce. You do, of course want the best quality ham you can find as it will make all the difference. Finally, I like to use passata, but you can of course use a tin of chopped tomatoes in their juices for a chunkier sauce. I'm not a big fan of chunky, so I tend to stick with the passata, but to each their own. 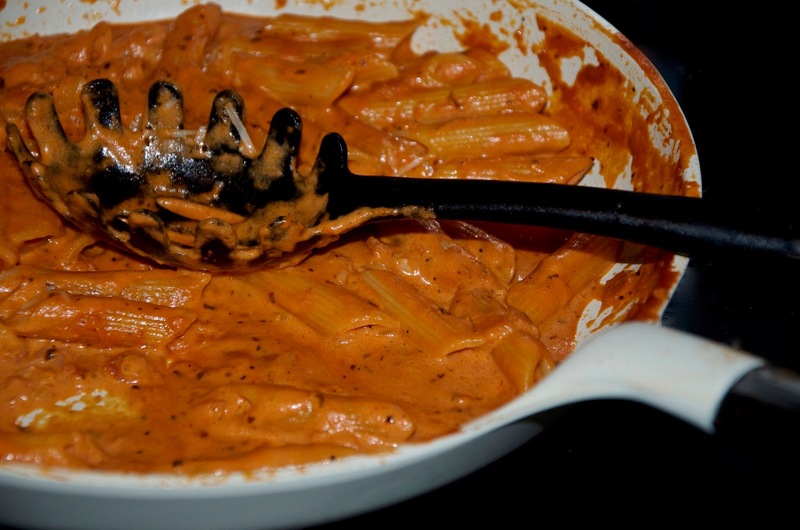 In terms of equipment, you'll need a large pot for the pasta and a large frying pan for the sauce. I took this opportunity to use the Liquida Frying Pan by TVS which is just as great to use as it is pretty to look at! It helps that it's big enough to fit all the pasta in and looks gorgeous, so I simply take this dish from stovetop to tabletop and the presentation is lovely. 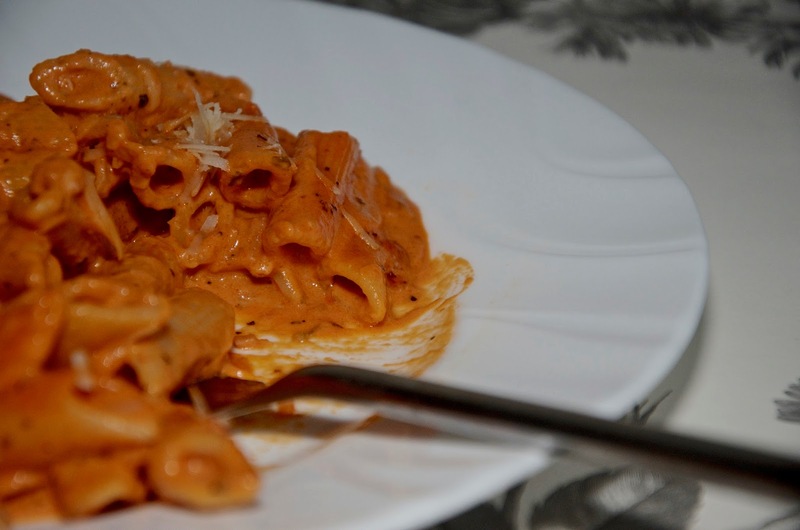 For serving, I prefer a red sauce pasta dish either in a pasta bowl of some description or on a beautiful white plate with a designed rim that's also either white or metallic - I don't like colors on plates to interfere with the vibrance of some foods, particularly with a red sauce. 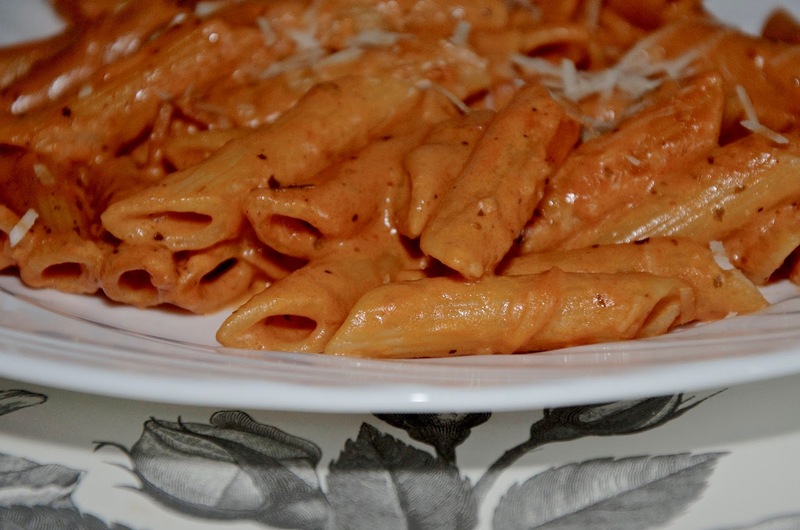 That said, it can be beautiful if the pasta is nicely framed when serving, especially if you're entertaining guests. 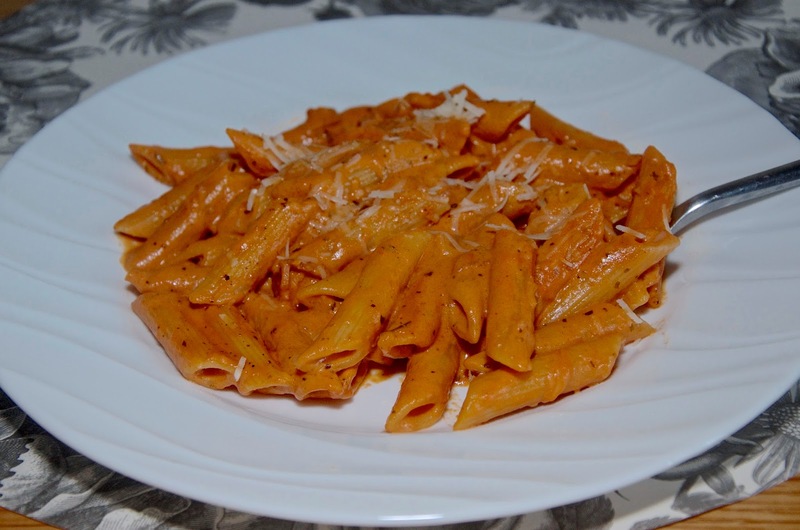 For this recipe, I used the Corelle Swept Dinner Plate which is inexpensive, beautiful and has a bit of an indentation in the center that helps as a guide for portion size. 1. Bring a large pot of water to a boil. Add salt and a drop of olive oil and cook the pasta until soft, but slightly al dente. Strain the pasta, reserving a cup of the pasta cooking liquid on the side and set it aside in the pot with the lid on to keep it warm until you've finished the sauce. 2. Meanwhile, melt the butter in a large frying pan over medium-low heat. 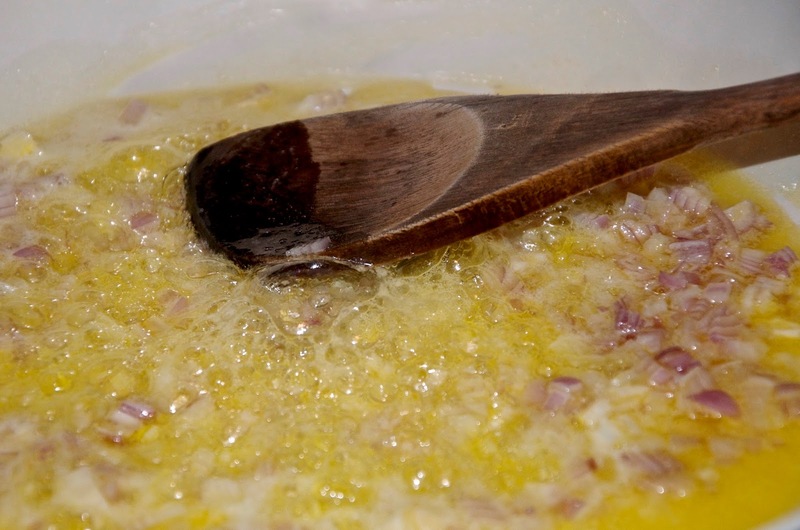 Add the chopped shallot and cook, stirring occasionally for about 5 to 7 minutes or until soft. Then add the dried herbs and the garlic and cook stirring for another minute or two until the garlic is soft as well, taking care not to burn the mixture. 3. Add the passata and chopped ham and simmer for 10-12 minutes, stirring occasionally. 4. Add the vodka and simmer for another 5 minutes. 5. Add the cream and 1/2 of the Parmesan cheese, stir and let it simmer away until the sauce gets a little thicker, continuing to stir occasionally. This should take another 5 minutes or so. 6. Reduce the heat to low and add the pasta to the sauce, tossing to make sure every piece is completely coated with the sauce. Salt to taste, keeping in mind that the Parmesan cheese will be quite salty. 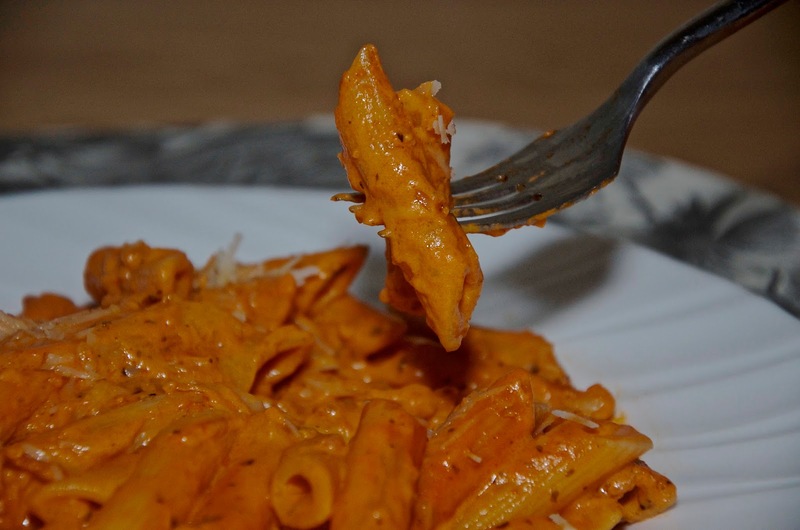 If the sauce is a little too dry or thick, add a some of the pasta cooking water 1 tablespoon at a time until you are able to coat every piece of pasta. Finish with a good grinding of fresh black pepper and sprinkle with the remaining Parmesan cheese to serve. For more Pink Julep recipes, visit the Recipes tab on the menu above (underneath the header)! For more information or to buy the TVS Liquida Frying Pan, click here. For more information or to buy the Cornelle Swept range, click here.